Meet Saphira - the newest member of our household. Isn't she cute? 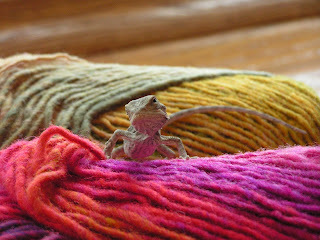 Can't you see her discerning eye for quality yarn (this is Noro she is standing on)? Miss K's green anole lizard died awhile ago and she has been wanting to get a new one ever since. She decided she really wanted to get a lizard that you could play with and would be more like a pet. The pet store recommended a bearded dragon so here she is. Given their love of the book Eragon, the girls named her Saphira after the dragon in that book. Now the only problem? They say she'll grow up to 18 inches long!!! Right now she's a big as a finger - how can she get to 18 inches? I have a theory that if we know her and come to love her as a baby we'll be less squimish when she is bigger. I sure hope it works! Maybe we can give her coffee to drink to stunt her growth . . . . Very cute and looks right at home with the yarn! 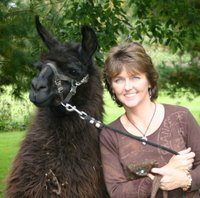 I hope Sapphire doesn't like to eat yarn! Cute as a button. I have read the first 2 Eragon books. When's the 3rd due out?? Soon I hope. How very open minded of you. At least you won't have to walk it three times a day, right? I just watched some late night talk show with a little girl and her lizards. She put them on their back and rubbed there tummy, appparently this puts them in a deep sleep for about 20 - 30 minutes and then she dresses them up and take pictures of them while they are sleeping. You can knit for the lizard. You new yarn is gorgeous.